Speed Racers’ crash site, the Duracell Battery family, warped versions on the classic Looney Tunes and Disney characters were all part of this far out maze. 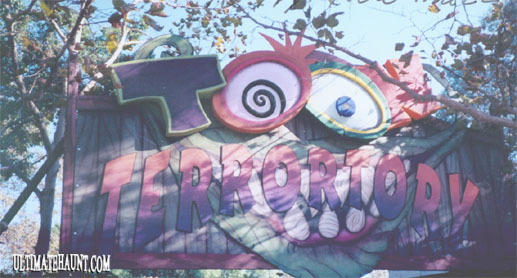 With the toon music and sound effects present, the entertaining aura of this attraction was very original. Knott’s described it this way: “contaminated cartoon characters from an abandoned Burbank animation studio create their own wickedly warped world of lethal comic strip terrors including exploding bombs, toxic poisons, runaway cars and falling objects of all shapes and sizes”. This maze only lasted two years, and was then halted to make room for the construction of “GHOSTRIDER”. CLICK HERE to view some pictures from Toon Terroritory! The psycho Boy Scout theme was introduced in 1996. The concept was funny from the start and Knott’s kept on making it better each year. 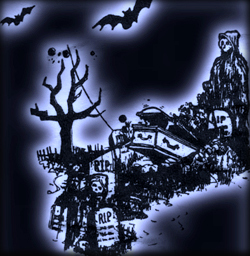 The themes inside display boy scouts gone mad, bloody dorm rooms, and shadows of campers in tents murdering each other. While boarding the logs, the camp counselor is announcing upcoming events (for example, the movie for the night is “The Exorcist”, and for crafts, making wallets out of human flesh, etc.). This is a classic theme for the log ride and has now been there for 5 years.